Fall is most definitely here. I adore fall. I love putting on rain boots and stomping through puddles. I love apple cakes and spiced cider. I love cuddly sweatshirts. Though I do have one cuddly-but-also-fashionable sweatshirt, there is certainly room in my closet for more. This Ultraviolet Tee hacked into a sweatshirt is a welcome addition! It’s pretty easy to draft your own sleeves to add on to the Ultraviolet Tee to make your own long-sleeve shirt or sweatshirt. 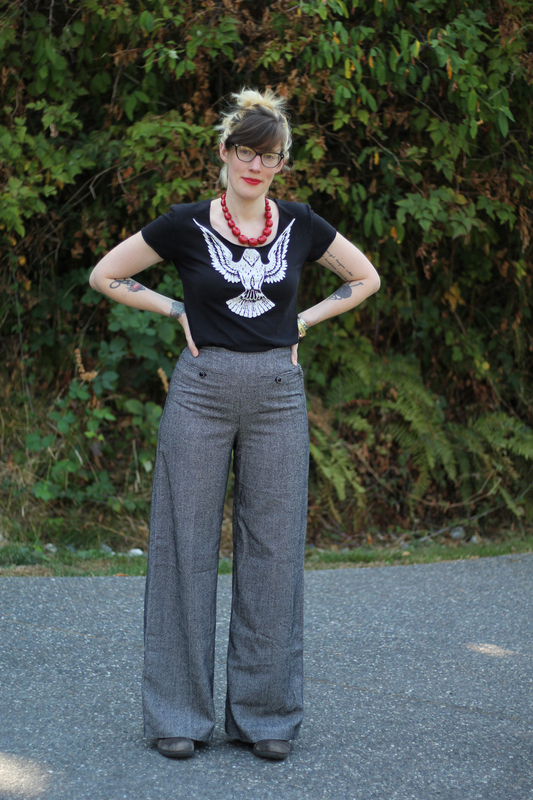 Since the tee pattern has a short cut-on sleeve already, it’s really simple to just add length to the bottom. Since the shirt is a boxy style, boxy (i.e. easy!) sleeves are a well suited addition. This is what my sleeve looks like. You can make the wrist narrower or wider, depending on your style preference. It’s likely you’ll want them to be shorter (as I have very long arms). Remember that you are adding on to the bottom of a cut-on sleeve that’s already part of the pattern so your sleeve will be shorter than if you were starting it from your armpit. For best fit, baste the sides of your sweatshirt together, try it on, and then measure how much longer the sleeve should be. Rather than making the sleeve a trapezoid, you’ll want to add a little bit of a curve to the top – 1.5″ of extra height should be fine. The top curve length should match the sleeve opening (at the seamline, so remove the seam allowances when you measure), but I’ll give you a hint: no perfect math is needed here. Measure the curve so that it is close to the opening width, sew the extra sleeve from the center to the edge (so that you perfectly center the sleeve), and then trim off up to 1/2″ on each side (blending the trim down several inches) if there is a mismatch. With such a boxy style you are unlikely to notice any such trimming! To give the sweatshirt a bit of pizzaz, I bought a large scale floral appliqué and sewed it onto the sweatshirt. I was surprised that I could find one I liked so much so reasonably priced and it certainly made for a faster addition than if I were to embroider it all myself! Very pretty! Did you have to trim the applique? Thanks! The appliqué came pre-trimmed. I did snip of a couple of flowers to make it the right size, but it’s pretty much as-is. After you sew the sleeve the the arm hole then you sew the side of the sleeve- how do you start sewing the side? I mean do you sew I then tee sleeve first to blend the sleeve and lengthened sleeve seams? If that makes sense? I’m not sure I totally understand your question, so let me know if this doesn’t answer it. When making the hack with sleeves I sewed together the shoulder seams of the Front/Back and then sewed the sleeve onto the armhole. After you sew the sleeve to the arm hole then you can sew the sleeve seam and side seam in one. This is sometimes referred to as flat sleeve insertion. If you would rather, you can sew the tee entirely as written in the instructions (without hemming the cut-on sleeve). Sew the seams on your sleeves so the are tubes. Then insert the sleeve into the armhole.